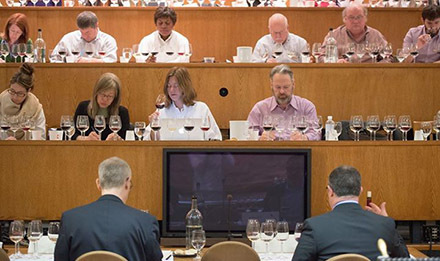 Members of the wine media (such as attendees at the Symposium for Professional Wine Writers, above) report fielding dozens of pitches, many of which are unrelated to the topics they cover. Camas, Wash.—Knowing whom you’re pitching to is as important when raising your profile as when selling your wine, according to a survey of workers in the shifting environment of wine media. Surveys conducted earlier this year of media covering the wine industry (primarily the consumer side of the business), found more than 70% are freelancers who receive regular pitches and scores of samples per year. Many also are active on social media, but despite the weltering range of outreach, the efficacy falls far short of what many in the wine business expect. “You really need to understand the context and what it’s like to be someone covering the wine industry before you can effectively serve them,” said Dixie Huey, principal of Trellis Growth Partners LLC, a small public relations and consulting firm in Camas, Wash.
• More than 71% are freelancers, some contributing to more than 10 publications. • 44% of wine media work full-time, but less than a quarter do so as staff journalists. Where do they hang out? • A third of the wine media have an active presence on Facebook and Twitter. • 90% are keen for recognition of their work on social media. How are people contacting them? • More than 70% of wine media receive pitches at least once a week, and 40% receive pitches daily—but just 64% are interested in pitches. • 40% receive samples at least once a week, while 8% receive more than 200 shipments annually. • Just 41% want samples to arrive unannounced; nearly half (49%) want to be pitched first. How do wine media want to be contacted? Huey was particularly surprised when survey respondents rated regions for the strength of their communications efforts. Napa Valley, for example, came out on top—as expected—but with just 37% of respondents rating the area’s wine industry as having strong communication. Meanwhile, some of the Pacific Northwest’s most acclaimed wine regions exhibited less strength in the minds of wine media. Communications from the industry in the Willamette Valley, for example, were deemed “strong” by just 22% of media, while the Walla Walla industry checked in at just 11%. Huey emphasized that the findings don’t reflect on the work of industry organizations representing the regions, but rather how media perceive the communication efforts of the region as a whole. And, given the variables at play, she isn’t sure if there’s a right answer. Answers to that question may start being formulated following a webinar the Oregon Wine Board is planning for December. Originally suggested by Ashland, Ore.-based communications consultant Marilyn Hawkins, the wine board recently approached Huey about the idea of providing guidance to its members. The request was timely, as Huey was in the process of her media survey. While the Oregon Wine Industry Symposium has occasionally offered marketing sessions, Michelle Kaufmann, communications manager for the Oregon Wine Board, said the emphasis in recent years has been on the digital sector rather than media relations. Some of the tips are the same, of course. Huey makes a point when it comes to working with media, urging wineries to communicate effectively to capture attention rather than distract it. Kaufmann hopes the upcoming webinar will focus participants on the particular needs of media and communications workers. Kaufmann noted that the small size of wineries in Oregon—like much of the Northwest—means most don’t have just one person handling communications. “Very few of them have communications people on staff or an agency at their disposal. Some might have a marketing person, but marketing is not the same thing as communications,” she said. Will the efforts bear fruit? Huey hopes to conduct a follow-up survey in 2017. Both research projects have raised $1,650 for nonprofit organizations in Oregon and Washington. Trellis donated $10 for each completed survey to an organization of the participant’s choice, including the Auction of Washington Wines; Salud! and La Clinica, which serve the needs of seasonal workers in Oregon; the Oregon Pinot Noir Auction; and Washington State University’s Mentor and Analysis Program.